A great soul, a hidden friend of Allah and spiritual heir of the Holy Prophet, Habib Abd al-Qadir al-Saggaf has returned to His Lord earlier this month. Born in the Hadramawt in 1910 Shaykh Saggaf who was blessed with long life, dedicated it in the service of Allah, the Most Glorious and His Prophet, upon him be peace.The spiritual Emperor of the People of the House and progeny of Alawi (may peace be upon Him) Abdul Qadir al-Saggaf was the son of Ahmad al-Saggaf (may Allah exalt His family). Habib Abd al-Qadir was someone who truly represented the Prophetic character and reached highest level of spiritual ascendancy in the ladder of the friends of Allah. 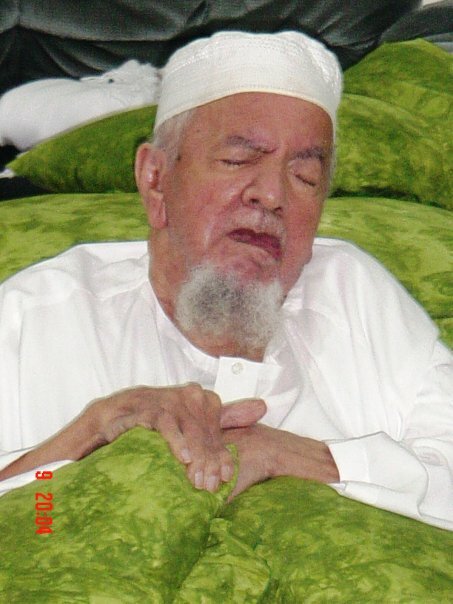 He was the Sheikh of Habib Umar, Habib Ali and Habib Hussein. He had passed on the responsibilities of the Ba'alawi Tariqah to Habib Umar some years ago. It is no secret that the station of Abdul Qadir al-Saggaf comes through his nearness to the Prophet Muhammad (May Allah bring us nearness to the final messenger in order we may honour him), dedicating his life to the example of the Messenger and gaining connection with his ancestor, the Emissary of God. A pillar which signifies ones nearness to Allah is humility, and Abdul Qadir al-Saggaf never fell short of this quality. He was renowned for his efforts to make people feel at ease, never feeling comfortable if the people around him were uncomfortable. He respected people, and thus he was respected, he asked for prayer and made sure his guests felt welcome – even his students. A major element of his honour derived from his subservient nature and immense shame before Allah. May Allah exalt the people of humility. Al-Habib 'Abd al-Qadir continued his teachings of truth in the Hijaz, travelling between Jeddah and the Sacred Sanctuaries in Saudi Arabia, spreading the knowledge and mercy that he had inherited from his grandfather, the Messenger of Allah, peace and blessings be upon him. He finally responded to the call of His Lord before Fajr on 19th Rabi’ Thani 1431/ 4th April 2010. The funeral prayer was the same night in the Masjid al-Haram in Mecca. May Allah shower him in mercy and raise him to the highest of ranks in Paradise. May we continue to benefit by this great vessel of gnosis. We ask Allah the Most Glorious and Possessor of Majestic Bounty to grant him His Choicest Blessings and to count us among those who benefited from him in this world and the next. Amen. Follow the link below to hear Shaykh Yahya Rhodus, someone who was honored to sit with Shaykh Saggaf, expresses his condolences on the death of the spiritual luminary and renown scholar. In this recorded audio Shaykh Rhodus shares a brief biography of Habib Abd al-Qadir and gives key insights from his life which provide a glimpse of what it means to be a beautiful human being. After praising Allah and sending blessings upon the Messenger of Allah he advised him to hold fast to taqwa of Allah (God-Consciousness). He said that the people of taqwa are of varying levels and taqwa itself has no end, since it is in reality a divine outpouring which people receive according to the readiness of their hearts. Those who have attained these stations are with the people with their physical bodies but with Allah with their hearts and souls. So be avid, my brother, to reach these realms in which you witness the greatness of Allah’s signs. This is to be achieved through inward and outward purity and protecting one’s limbs from committing acts of disobedience. If the slave uses his limbs in the service of his Lord, Allah will protect him from Shaytan: (in Quran its said, the Lord declares) 'truly you (Iblis) have no power over My slaves'. Seek constantly the descent of Allah’s mercy through calling upon Him in a state of brokenness and lowliness, as nothing is more conducive to bringing forth His mercy than the slave’s recognition of His own weakness, and Allah is more merciful to His slaves than a mother is to her child. That is (the Bounty) whereof Allah gives Glad Tidings to His Servants who believe and do righteous deeds. "(O Prophet) tell (people) I don't ask you any wage (in return for my service to you in my messengership) except to love my near kin. And if anyone earns any good We shall give Him an increase of good (in return for it). for Allah is Oft-Forgiving, Most Ready to appreciate (service).